THE WASHINGTON CAPITALS blew out the Philadelphia Flyers 6-1 last night to take a commanding 3-0 lead in their opening-round series. But the win is being overshadowed by an ugly hit that was lucky to avoid serious injury. A little over halfway through the third period, the puck was dumped deep and Capitals’ Dmitry Orlov chased it into the corner when he was hit from behind by Philadelphia’s Pierre-Edouard Bellemare. Orlov went head-first into the boards and somehow avoided serious injury. Replays showed just how scary the hit was. 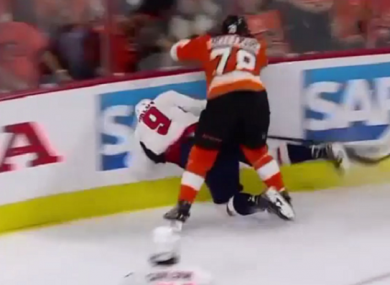 While Bellemare did not seem to accelerate through the hit and did look concerned afterwards, he clearly did not let up despite seeing the back of Orlov for several strides. If Bellemare has anything going for him, it is that Orlov was not seriously injured, suffering just a cut to his nose. He was even seen smiling on the bench shortly after the hit. Still, former player and current NBCSN commentator Jeremy Roenick made it clear that this type of hit needs to be punished severely because the potential for serious injury is high. “This disgusts me in the biggest way,” Roenick said after the game. If the suspension is just for the rest of the playoffs, it could be as little as one game as the Flyers are now facing elimination. So it will be interesting to see how far into next season that Bellemare will be forced to sit. It could be a while. Email “'Disgusting' hit overshadows Capitals' NHL playoff cruise”. Feedback on “'Disgusting' hit overshadows Capitals' NHL playoff cruise”.